Rolex GMT Explorer II Ref 1655 was first introduced in 1971. It was powered by a 1570 or 1575 and came with a fixed bezel. I think you need to reach a certain age before Rolex begins to hold a siren call for you. I recently turned 30 and it wasn’t for long before the Rolex bug bit. 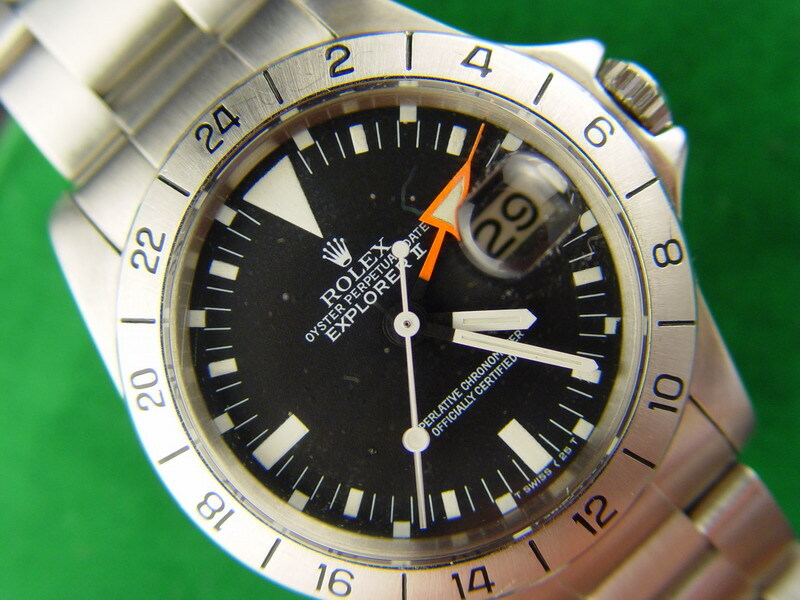 Alas, it was a vintage Rolex GMT Explorer II reference 1655 that caught my eye. Unfortunately, Rolex stopped making this eye catching “Steve McQueen Rolex” model since 1985. 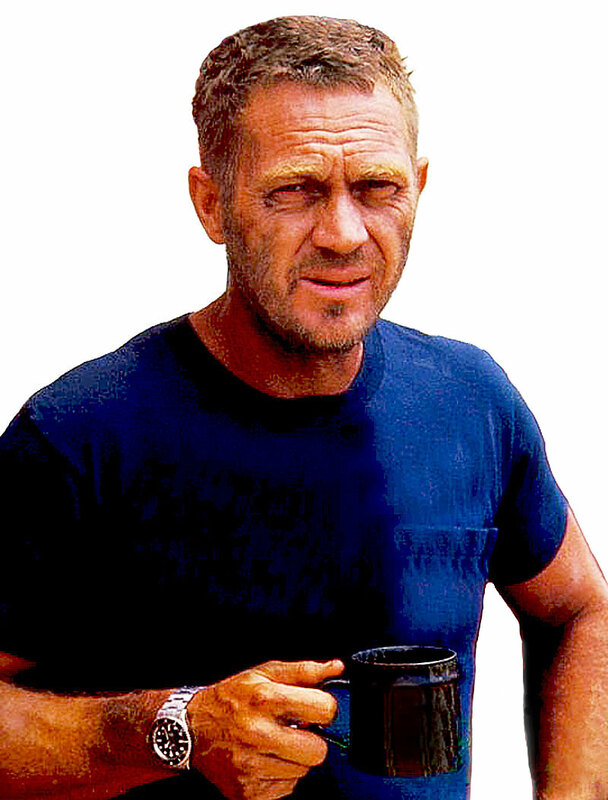 Before you get knickers in a bunch and self righteously correct me that Steve McQueen’s watch is the TAG Heuer Monaco in Le Mans, I’d only tell you quite humbly that you sir are dead wrong. He may have worn a TAG Heuer Monaco in reel life but the Explorer II was his real life wrist accessory; Eventually I settled on a Rolex GMT Master II but I digress. 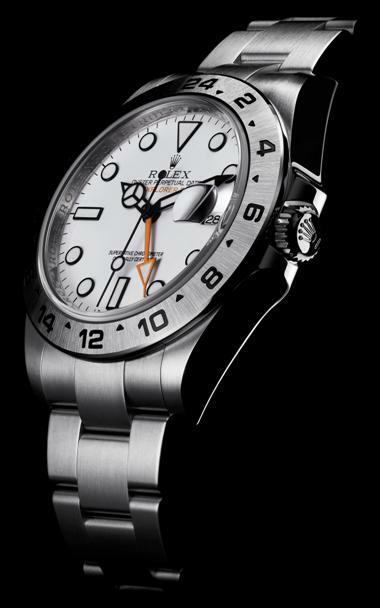 Baselworld 2011 was the venue for an all new Rolex 216670- the orange hand Rolex Explorer II. Marking the 40th anniversary of the original Explorer II, this Rolex 216670 Explorer II enjoys a growth spurt to more contemporary watch case dimensions weighing in at 42mm and equipped with the NEW Rolex caliber 3187. Conceptualised and built completely in-house, the Caliber 3187 includes new innovations like Paraflex shock absorbers and parachrom hairspring. The 24 hour GMT hand is done in the original orange that the 1971 original (and hopefully, my next watch) uses. The 2011 GMT Explorer II uses a white dial together with the “Mercedes” minute hand though truth be told, I preferred the vintage hands better. Like the original, the 2011 version has a fixed steel bezel.